I wrote in March about The Long Game—the slow assimilation of knowledge and experience and the increased making of my own living each year. I wrote of my hopes for the summer: my desire to make better use of the wild blackberries, to can my own tuna and perhaps pears, to take better advantage of apple abundance. I hoped to be more relaxed and have a better control over my life and work, for I always have hope in the spring, when the summer lies out idyllic in front of me, devoid of all the eventual mistakes and failures and neglect. It’s a beautiful blank slate in those early days. Not long after that entry, the blog fell silent. Lacking a computer at home, my only internet access came sporadically via the library, which couldn’t support blogging. Instead I fell fully into the summer, continued to play the long game, and painted the summer’s blank slate with sweat and dirt, blood, work and play, all the inevitable mistakes and failures and, as well, the joys and successes. The steps along the path, in other words, some sturdy and others stumbled. I canned so much. I canned tuna with my roommates: 64 half pints altogether, 32 of those for me. That will keep me well-stocked in tuna for the year. I made a couple dozen half pints of pear ginger jam, some honey lemon apple jam, close to three dozen pints of tomato sauce, about a dozen each of salsa, bread and butter pickles, and zucchini pepper relish. A batch of ketchup and caramelized red onion relish. I even made some of my own pectin to experiment with during next year’s jam-making. Despite my intent to take advantage of the blackberries this year, I made only two batches of jam (one of which failed due to divided attentions and, thus, became blackberry syrup.) In terms of weather, we had a better-than-usual spring out here followed up by an initially gorgeous summer. The blackberries came on early, ripening toward the end of July. So I made the aforementioned initial batches of jam and felt confident I would be making much more as the summer unfolded. Then it drizzled. The blackberries molded. I had time; I didn’t panic. The sun came back, the berries dried out, the moldy ones dropped off the vines and new ones took their place, slowly ripening. Just as I was about to make more jam . . . it rained again. Just a bit. Just enough to mold the berries. And then, before I knew it, we had a stretch of rain and overcast days in September and then, toward the end of the month, it really rained. Two successive storms featured a perfectly normal level of heavy rain and wind—for November, that is. But it was September, instead, and we set a new rainfall record for the month and by that time any dreams of further blackberry projects—jam, syrup, soda, frozen—were long dashed. Oh well. That’s how it goes. I couldn’t feel too bad simply because of the abundance of other canned goods. Despite those odd September storms, it’s been a glorious season, and even October has been shockingly sunny and warm, with almost no rain this month. As I type this, the sky is clear and blue, the sun bright, a load of laundry out drying on the clothesline. I wish I had a bit more blackberry jam, sure, but I can’t complain when I’m loaded down with pear ginger jam instead and grew so many tomatoes that I actually felt compelled to make ketchup because I already had more tomato sauce than I would likely eat in a year. And there are still apples to deal with, likely leading to apple butter and more honey lemon apple jam. It’s fine. I’ll get another shot at the blackberries next year. That’s the way the long game works. Canning wasn’t my only success this year. I stumbled into a bit of seed saving, as well. A number of towering kale plants from the fall of 2012 flowered out this spring and went to seed. I kept watching them as the seed pods dried and, finally, one sunny and breezy day in the garden, thought that I couldn’t let this opportunity pass. So I grabbed a stray garbage can and half-assed my way through a slow winnowing process, leaving me with a plastic bag full of seed and chaff. A week or two later, after picking up an old fan of mine at my father’s house, I winnowed the seed again until I had something close to a quart of clean kale seed, derived from Wild Garden’s Ruso-Siberian kale mix. Lord knows what I’ll do with all the seed, considering I don’t have the desire or need to grow a few tens of thousands of kale plants, but I imagine I’ll give what I can away to friends and family. Emboldened by that experience, I next started clipping seed heads off of bolted dill and tucking them in a paper bag. Then I realized, one afternoon as I was cutting up tomatoes to make some sauce, that I could save some tomato seeds, too. I researched the process and soon was squeezing out seed and gunk from Black Krim, Amish Paste, and Indigo Rose tomatoes into separate mason jars. A few days passed, mold grew, I drained off the gunk and water and washed the seeds and spread them on some coffee filters to dry. Now I have three small mason jars with dried tomato seeds; we’ll see what kind of plants they grow next year. It’s not much, this seed saving, and none of it was particularly planned. I simply took advantage of opportunities as I stumbled into them. I don’t know yet how the dill and tomato seeds will sprout—if they’re viable and will grow healthy plants—but I already have a couple healthy kale plants out in the garden planted from the seed I saved early this summer. Next year will likely see more seed saving and even some other experiments, like making my own mustard from home grown mustard seed. And I bought a copy of Suzanne Ashworth’s Seed to Seed, so I’ll study that over the winter and see what I can accomplish next summer. As for the garden itself, I had my successes but also a majority of this summer’s failures and neglect. I didn’t mow and maintain it well enough in the spring, which ended in a garden full of moles and voles. I suspect the nice spring and summer didn’t help in this regard—there seemed a lot of rodents around in general—but I did myself no favors by not knocking back the weeds and grass around the garden. It was a mess, overgrown, underutilized and somewhat neglected due to its distance from my home. So while I grew an abundance of tomatoes, basil, and peppers in the greenhouse, I lost quite a lot of my outside crops to rodents and a lot of my root crops were stunted by tunneling moles. I harvested far fewer potatoes this year, partly due to rodents eating them and partly due to using saved seed from last year that hadn’t been saved well enough—it was in poor condition. I seeded quinoa twice and both times lost all the seedlings to slugs despite my best efforts. My carrots were stunted by moles and eaten by voles. I still got some, but not nearly as many as I hoped. My beets also were stunted and never sized up. The kale did quite well; much of my broccoli was decimated by birds. Deer got in on the act, too. Last year, I didn’t have many problems with them despite the fencing around my garden being capable of keeping out sheep but not deer. This year, they showed up more regularly and enjoyed munching on my romanesco just as they were starting to head up. I grew a ton of onions and have bags of them for the winter, so that was nice. They still were limited a bit in size by mole tunnels, but I have plenty for myself regardless. So more lessons learned. I need to pay more attention, to better maintain, to keep the garden cleaner. I might have to be more proactive with the moles, perhaps experiment with sulfur tablets. I haven’t decided. Luckily, I likely will have a whole new set up next year, lots of gardening space where I live, an opportunity to do quite a bit more than I so far have—assuming I can manage the work load. I’m excited for that and I’ll write more about it as it comes together. Most important, though, is that I have another summer under my belt, more lessons learned, more skills practiced, more experiments engaged. I have some seeds, I have more canned goods than last year—an abundance, really—and I already have some new dreams for next summer’s blank slate, for that canvas aching for my sweat and blood, promising so many successes and not yet weighed down by mistakes and missteps, by all the tough and valuable lessons each season brings. Last year, I started on the garden late. Aside from sneaking in a small potato patch in April, I didn’t really get going until late May and early June. I had some decent reasons—the terrible spring weather, the need to break new ground, having to clean years of junk out of the hoop house. (It’s terribly sad to see an abused and mistreated hoop house here on the Oregon coast. They’re so precious!) I waited on a friend’s tractor work. But really, I had some opportunities to get an earlier start and simply didn’t get myself in enough order to take advantage of them. I put it off. This year, I aim to get an earlier start. Of course, the danger with such a notion is that March can be tricky. A few sunny days arrive, a rush of warm weather, the daffodils bloom out and suddenly you’re thinking that garden abundance is just around the corner. Unfortunately, what’s really around the corner is—more likely than not—a wet, cold, miserable, hail-filled April. To plant in optimism in March is a dangerous game indeed out here. Therefore, I’m attempting to temper my enthusiasm while also getting some good work done and a head start on the planting. I don’t want to fall into frustration, but I have no interest in not really getting going until late May again, either. It is thus that I found myself in the hoop house on Monday, untying the old and dead tomato plants from their baling-twine trellises, ripping them from the ground and piling them outside. I cleared a multitude of weeds, clumps of grass, and plenty of other dead plants I never cleaned out from the previous season. Black, bare and woody eggplants and peppers and basil, all plucked from the soil and tossed on the pile, ready for composting. Old, brittle, but still-clinging cucumber vines excavated. The beds slowly reemerged as I worked, their outlines and contours ragged, piece meal, shrunk from last summer, the paths having slowly widened with each walk down the rows. They’ll need to be reworked, re-dug, amended before the new round of crops go in. After about four hours of work, I stood back and looked at the results of my work, of those exposed beds ready to be worked up and planted. Thick, green grass still ringed the inside edges of the hoop house, but not in the beds. I can get that out later. It was a dusty job, the inside dry. Coming home from the job, it took me a while to get the dirt out of my nose, to dig out that blackness. I remembered it from the year before, whenever I would spend a time under the plastic, digging up a bed or weeding, tromping around and puffing the small dust clouds. I put on the sprinkler inside, just to get some extra moisture into the soil before I worked it up. Tomorrow I’ll dig in there more, fluffing and shaping the beds, adding in some amendments, and hopefully will have some beds seeded by the end of the day—salad mix, perhaps, spinach, mustards, maybe some head lettuce. Greens. My body has been craving greens of late. I always eat so heavy in the winter, meat and potatoes and squash, cheese and bread, dairy. I eat that always, granted, but more so in the winter. I’m excited for the garden, for another year of growing. Earlier today, I had a piece of toast with blackberry jam, canned last summer. A couple nights ago, polenta topped with a tomato sauce from last year’s garden, tucked away in the freezer. A few days ago, oatmeal for breakfast, with butter and milk, honey, and apple butter that I cooked and canned in October. And last Wednesday, I took a jar of salsa and pickles to share at the Grange potluck. The next day, mixed some salsa with mashed avocados and some minced onion and garlic. Instant guacamole. Granted, these canned and frozen foods from last year aren’t the bulk of my diet, of my calories, but they’re quite nice to have on hand. At Christmas time, jars went out as gifts, too, and for some birthdays, as well. Still there are roasted tomatoes stuffed in the freezer, canned tomato sauce on the shelf. I almost never buy tomatoes from the store—it just seems an offense to me. The ones in the freezer keep me in sauce, in spaghetti and pizza, marinara for whatever. I realized after working in the hoop house that I’m playing the long game. I’ve been doing it for years now, at least since 2009. I didn’t always recognize I was playing the long game, but that’s indeed what I’m doing. Each year, I build on my knowledge and skill, I better figure the next steps, I improve on the old and attempt the new. I expand the repertoire. Last year, I started the garden late. This year I’ll start it earlier, soon, get those first seeds in the ground in the next couple days. Greens in the hoop house and peas outside, covered up with a bit of torn row cover that Ginger is going to generously let me have. Just in case of hail, which is almost a certainty. With luck, I’ll have fresh greens and peas this year before I even had the garden started last year. And right now, too, last fall’s kale is coming back, fresh leaves emerging. That’s a remnant, a legacy from last year. The ground is already broken. Weedy and grassy, yes, but the beds are there, even if they’re vague. They’re ready to be worked, far more than they were last year. I just have to get the timing right, to get out there during a stretch of sun and dry, when the soil can be worked without clumping and hardening it. But it’s so much more ready than last year, and so am I. It builds. Three years ago, I planted a ragged and broken garden, a small bit of nonsense that I did all wrong, discarding the knowledge I had for a misguided ideology and attempted shortcuts. Last year, I grew a real garden, late and also ragged and not as ambitious as I originally planned, sometimes a bit neglected, managed a bit haphazardly but still quite productive. I got veggies out of that. I got broccoli and kale and peas, potatoes and summer squash, winter squash and salad mix and peppers and eggplants, basil and parsley, romanesco and beans and mustard greens, head lettuce. Still out there is the legacy—the husks of winter-killed plants—various brassicas, amaranth from the salad mix that grew giant, dead and spindly bush bean skeletons—two rows of parsnips I have yet to eat, and carrots sweetened by the winter cold and putting out new growth, in need of harvesting before they become woody and bitter, their tops nibbled and chewed by rodents. And still I have potatoes in the ground! What am I doing? Got to get those out, set those aside for eating and use the ones already harvested and sprouting as this year’s seed. At least some of them—don’t need as much seed as I have sprouting potatoes. How nice, though, my own potato seed this year, not from a catalogue. These early spring days, warm and sunny, they just make me want to get in the dirt. They make me itchy. I want a couple days of good, hard, tiring work. I want to be dirty, sweaty, to smell of soil and plants, chlorophyll, and to have my fingers turn black with tomato tar—even though that’s still a ways off, the tomatoes. (Acyl sugars, for those who want to get more technical than “tomato tar,” is what turns your hands green when you handle tomato plants.) I want to get out the push-pull and the digging fork, to work the soil, mingle in my blood and sweat, get the heart rate up. I want that sense of life and importance. Of necessary work. I want to get back out that farmer within. It’s nice, too. This year will be less overwhelming. That’s what I tell myself anyway—maybe I’m being too optimistic. But there’s not so much to do to get started. Don’t have to break the ground. Know somewhat what I’m doing, even if I plan to do some things different this year. I have a raft of mistakes made last year that I get to learn from this year, to try to correct. New mistakes will inevitably arise, but I won’t have to correct those until next year. This year, I just have to weather them. I can do that. I’m not so desperate that they’ll break me. That’s why it’s so good to make those mistakes now, to learn the lessons when there’s luxury, when there’s a cushion. I have flexibility. I have margins for errors. This year, I’ll be more on the blackberries. Last year, I picked late, during the final and less abundant waves. Still made a lot of blackberry jam and a bit of syrup, but this year I’m going to be better on it. More jam, more syrup, but also soda. Lots of blackberry soda, absolutely. And maybe I’ll freeze fresh ones, have them for the winter. I don’t know if there’s room or not, but I bet I can find some. There are freezers around. And the apples, too. This year I’ll be better on the apples. Maybe I’ll get to can pears—there are some pear trees where I moved to, and I bet a canning party might be in order later in the summer. Last year I wanted to buy tuna off the boat local out here and can it, but I never did that. This year I plan to. Buy off the boat, prep it and borrow a pressure canner, or maybe join in with Ginger when she’s doing her tuna. It’s just a slow improvement coupled with the laying in of new habits and practices. It’s a layering, year over year. You do a little more, lay a bit more groundwork each new season, build up a bit more infrastructure, increase your knowledge and better your habits and make it routine, make it normal. It becomes easier. You know what to do. It’s just the long game, end of the day. I’m playing the long game. It started years ago, and it’ll be going years yet. So many yeas. Tomorrow the hoop house, working the beds, amending, seeding, and the peas planted outside, covered with row cloth. Years from now, who knows? Something more, no doubt—layered, heftier, built year by year, the culmination of much of a life. The abundance of this year’s foray into water-bath canning. This is but a portion of what all I’ve canned, and there’s still more to be done. From left to right: blackberry jam, tomato jam, blackberry syrup, tomato puree, apple sauce, apple butter, salsa, pickled green beans. The reintroduction continues. I’m catching readers up on my summer and current life in anticipation of resuming this blog, with some adjustments to the thrust of the content. In the first post, I talked weather. Now I want to talk about my garden and food preservation. Okay, I don’t actually have a pantry here. More like a cupboard, and counters, and a multitude of jars spread all over the place in various nooks and crannies. The contents of those jars vary: blackberry jam and syrup, pickle spears, bread and butter pickles, apple butter, apple sauce, tomato puree, whole tomatoes, tomato jam, pickled green beans, salsa. There are over 100 jars in all. It started in early September and has been going ever since, though now I’m starting to slow down. But I hope to make more salsa and apple sauce, pickled jalapenos and other pickled peppers, sauerkraut and perhaps some other ferments. I still have a couple cases of jars that I’d like to fill. To be honest, I’m proud of all this. I’m excited, too. Before this year, my only foray into water bath canning was making some pickles last year and helping with pickled beans three years ago. I had experimented with fermenting various veggies, but I hadn’t yet fallen into the world of traditional canning. This year I was determined to tackle that project. I picked up a simple canning set and waited for the blackberries and tomatoes to ripen—my main goals. I wanted jam, syrup and tomato sauce above all else. If I managed some other projects, that would simply be icing on the cake. I started late. I should have began with the blackberries three or four weeks before I did. However, the summer here—as mentioned in the previous post—has been warm and sunny and went late, with minimal clouds and almost no rain until the last few days. So the blackberries held well, molding a bit after a couple of misty days in the second half of September but bouncing back with new fruit. I was able to harvest out enough for multiple batches of jam and two small batches of syrup, which I wanted as a local replacement for maple syrup. Granted, I’ll still enjoy myself a bit of maple syrup over the course of the year—there’s no real replacement for it—but one of the main goals with my canning is to attempt to replace at least some non-local sources of food with the most local of foods—those from my garden or otherwise off the land I live on. So, wild blackberries and tomatoes and apples from the farm’s two apple trees were high on the canning list. Admittedly, I have brought in some outside food. My mix of cucumber seeds turned out to largely be lemon cucumbers, which are perhaps the worst for pickling, and I had no hot pepper plants in the hoop house—just bell and sweet. So I picked up jalapenos, other hot peppers and pickling cucumbers from a couple local farms. In terms of other goals, I wanted to extend and maximize my harvest from and use of the land I live on, to reduce the money I spend on buying canned goods, and to provide myself a stock of homemade goods for Christmas and birthday presents. I figured jam, syrup and tomato sauce were three good areas to target in that regard. Nice jam is expensive at the store (in terms of personal use) and a great gift when homemade. Also, I use a good amount of tomato sauce throughout the year. Meanwhile, there are a number of Himalayan blackberry thickets spread across the farm and I had a hoop house full of tomatoes, producing fruit far beyond what I could eat fresh. A perfect combination of factors. If there’s one thing it seems we all should be in a world either lacking in abundant energy (eventually) or heading that way (now), it’s opportunistic of available resources. Himalayan blackberries are something of a pain and a nuisance, but they do produce copious amounts of sweet berries without any tending, and they’re well established around the farm and, well, pretty much everywhere out here. And the beauty of tomatoes is that if you can keep blight or mold from knocking them out and provide them a bit of pruning and tending, they’ll produce a ridiculous amount of fruit for you that just invites preservation and enjoyment throughout the cold and dark months of late fall, winter and spring when relatively little or nothing is growing out in the garden. So I began there, with the blackberries and then tomatoes. But then I moved into the copious and overwhelming number of green beans and then took on the desired projects of pickles and salsa, which partly required bringing in the aforementioned outside food. Finally, I began to harvest out some of the abundant apples on the farm’s two apple trees (it’s been a good fruit year) and made apple sauce and butter. It’s been so good. First of all, I discovered in my work that canning really is quite easy. Most of my jars have sealed fine and, while it’s somewhat time-consuming, it’s really not a challenging task. There’s something very satisfying in it, in fact. Much as with building a wooden gate, there’s something incredibly fulfilling about a task that ends in a real, tangible product. Finishing up a bout of canning with a cache of cooling, canned goods on the counter provides a satisfaction unmatched by so many of the sort of ethereal tasks common in today’s supposed information economy. But also, watching the canned food pile up has been a good antidote to the other reality manifesting in the last few weeks: the dying of my garden. It’s not yet all gone, and with luck the tomatoes will survive into November (though there are rumblings of an upcoming cold snap in the weather models, so I may not be that lucky.) However, a few weeks ago I started losing the outside crops one by one. A chilly night killed off the outside basil first of all. Then went the green beans a few nights later. The squash at that point was already looking a bit ragged but a yet cooler night perhaps a week later finished off the last remaining hardy plants. I went out one morning to see a stretch of perked up, but browned and blackened squash leaves whereas the day before they had still been a relatively healthy green. About that same time, the basil in the hoop house started to blacken a bit, though some of the plants remained strong. And the tomatoes and cucumbers are looking more ragged by the day, though they’re so far hanging on. Some of the garden remains fine, such as the various brassicas, the lettuce and the root crops. The lettuce will go if we get a real cold night, but the more established brassicas and the root crops should be fine. They’ll provide me a bit of fall and winter eating, although my elaborate winter plans didn’t pan out to the degree that I had hoped. This was due to my own failure to follow through on those ambitious plans more than uncooperative weather or any other garden-specific variable. I simply lost some of my steam in the late summer and the fall starts that I did get in, I got in late. I have a number of very small plants that may not survive a good cold snap or that—even if they do survive—probably aren’t going to grow enough to give me any real harvest. Although, if I’m lucky, I may get some nice, early spring harvests from them if they survive the winter. In some ways, the garden dying off is nice in that I no longer have to worry about maintaining it (not that I’ve been doing too good a job of that of late, anyway.) On the other hand, it’s another good lesson of just how tough a (partially) self-sustaining life is. I have the grocery stores for the winter, of course—which I’m going to need even with my multitude of canned goods. If I didn’t, I would be in a bit more dire of straights with the current garden (though I do have probably a couple hundred pounds of potatoes, mostly still in the ground.) I would have had to have been much more on top of things if the garden was going to be one of my main sources of food going forward. Still, I realize that this all requires a long process of successive steps (and a number of setbacks, as well.) There’s a steep learning curve to this sort of life, particularly within the context of a culture that hardly values it. In the meantime, I can celebrate my many filled jars, my new found canning skills, my jump start on Christmas gifts, and I can dream of just how much farther along I might get next year. I plan to start my canning earlier in 2013, to expand my repertoire, and to make it more of a year round affair rather than just a flurry of activity in the late summer and early fall. I also hope to better plan my garden around canning, preservation, and winter crops next year. Not all of this will happen and what does happen may not go smoothly, but one of this summer’s many lessons is just how much you can accomplish even when all doesn’t go according to plan and even when you realize you don’t quite have the amount of personal motivation, spare time and energy throughout the summer as you might optimistically imagine during those first promising days of spring. Looking at the picture posted above, though—a mere portion of what I’ve canned—I can’t help but feel a certain satisfaction, joy and pride at what I’ve accomplished. So here’s to a winter of good eating, and future winters of even better eating. And here’s to the slow emptying of the “pantry,” and the eventual replenishment of the same. I love butter. I grew up eating margarine, but those were dark days indeed and I try not to think about them now. Instead, I think about butter, and I eat it. I slather it on toast, on cornbread, on pancakes, on pretty much any sort of baked good. I love cooking eggs in it, sauteing onions with it, roasting potatoes in it. I love baking with it. It’s my main fat. Sure, I’ll use olive oil at times and occasionally something else but butter is my standby and I go through a decent amount of it. I hardly know what I’d do without butter. This seems appropriate to me for a couple reasons. First of all, I feel right eating butter. Animal products as part of my diet just work for me. I feel better eating that way, more satisfied, more satiated, with greater energy. Something about the combination of my genetics, heritage, childhood diet, and so on comes together in that way. Second, I live in dairy country. I live right on the Tillamook county line in Oregon, home of Tillamook cheese and with a fine history of dairy farming stretching back many years. It’s a tradition that continues to this day and fits this land—and taking advantage of that local resource only makes sense. In other words, my personal and local context fits butter. It doesn’t fit, say, olive oil. That doesn’t mean I don’t have a bottle of olive oil on my counter, but let’s just say the butter is in a more accessible location. It’s the old standby, after all. I wrote about that context in my previous entry in The Household Economy. In that post, I used an overabundance of thought about butter to come to a philosophy of homesteading that hit on three main themes: context, education, and patterns. While other aspects will inform the homesteading adventures I’ll be writing about in this series—personal enjoyment and interest, for instance, is kind of a big one—those were the three tenets that I thought I would focus on in the hopes of making this series a bit more than just a number of how-to guides. I already covered the relation of butter to the above tenets in the above-linked “Considering Butter,” but I’ll hit on the high points again. In terms of context—aside from the aforementioned relevancies of personal taste and local tradition—I receive a gallon of raw milk each week from a local dairy. The milk is delicious and healthy, the cows grass fed, and the milk’s fat content higher than whole milk from the store. Left alone for a couple days in my refrigerator, I can skim around a pint of cream off the top and use that as my base ingredient for making butter. I use an already-existing resource, bring a small bit of my living into my own household, and increase my personal resilience. It’s coherent. In the sense of education, I noted that butter is a mix of butterfat, milk proteins and water and that it’s created by agitating cream so as to join together the molecules of butterfat by breaking down their surrounding membranes. That simple knowledge, combined with the knowledge that I can skim cream off the top of my own supply of raw and non-homogenized milk, allows me to see the context in which making my own butter makes quite a bit of sense for me. It’s basic knowledge, but even much of our most basic knowledge in regards to homesteading has been lost over the last couple centuries. 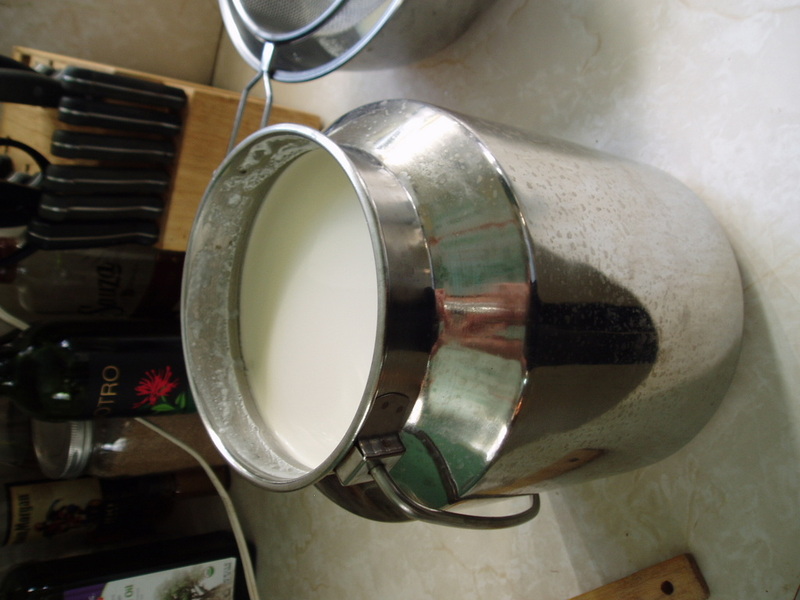 A steel pail full of fresh, raw milk, straight from grass fed cows. So delicious. I can’t tell you how happy this sight makes me, every time. In terms of patterns, I noted the local abundance of quality dairy farming and the attendant access to raw milk and cream. If I want to live in a local context, then it only makes sense for me to gain access to locally-produced milk—either through money, barter, trade or gift—and then to use some of the cream from that milk to provide myself butter. It helps wean me from globalized supply chains and an industrial economy that I don’t believe is well-designed for the future and it increases my integration into the local community, as well. It works in patterns and systems, cycling in on itself and rippling its effects throughout my life. Something as small as butter can do so much. This sense of pattern and reinforcement, in fact, is something I want to talk a bit more about. It exemplifies much of the ideal behind homesteading. Yes, there’s the intense satisfaction of making something with your own hands and providing for yourself, but it really goes beyond that. There’s little in going to the store and buying butter. Perhaps you’ll run into someone you know or make some small talk with the cashier. You’ll help to support a local business and likely will support some non-local businesses, as well. It’s not devoid of impact, but it doesn’t burrow you into your community in the way that making your own butter can. In making highly efficient and focused, globalized supply chains, we’ve largely insulated the recipients of those supply chains from the ripple effects of their patronage. When I buy butter at the store, I often don’t know the dairies involved, the people who run them, the cows who are milked, what they eat, what the land looks like, how that butter was made, who made it, how they’re treated or where they live or if their work supports them well, and a thousand other bits of information that are intricately a piece of that one pound box of butter. But if I bring that into the household, I begin to better understand these ripple effects. For me, it’s particularly pronounced because I get the milk, and thus the cream, locally. I know the farmers who produce my cream, I know the cows whose bodies it comes from. I know what they eat. I’ve touched and talked to them. I’ve walked on the same land they walk on. I know whom I support and I much better understand the context and ramifications of my decision to drink milk and eat butter. Skimming the cream off the top of the milk, which has been sitting undisturbed for a couple days. My getting that milk integrates me more into my local community, building connections. My making butter thus does the same. However, beyond the local community and land, my making butter also informs my understanding of the natural patterns that butter has always been placed in under the best of circumstances. It helps root me in an entirely different way of thinking. Buying butter at the store places me in the industrial economic context of making money at a job, spending that money at a store, and consuming what I spend. The connections are frayed and broken, or so spread through an intricate web of globalized commerce that I could never track down the ways in which they intersect, reflect and amplify each other. And that lack of knowledge, in my mind, is a huge piece of the broken world we live in now. We don’t understand our actions, we don’t understand the ramifications, and we find it increasingly hard to live our lives well when we don’t even know what our living does to the rest of the world. By bringing more and more of my economy into the household and rooting it in a local and personal context, I’m better able to gain a grasp on those ramifications, those intersections. I begin to understand how to better live my life. I begin to see the patterns. The farmers raise the cows, who eat the grass in the pasture and the hay in the barn, who walk the fields much as the farmers do. I trade my own labor—or money from labor at another nearby farm—for the milk, which I take home in a steel pail. Already, by knowing well the place where my milk comes from and how I acquired it, I have a far more complete understanding of how I’m living my life. But it doesn’t stop there. I bring the milk home, skim the cream, and make the butter. Now I know the production of that butter and how it got to me. I also understand the process of making butter and begin to see why this was such an integral practice in times past, when cream was produced on the homestead and of course you would turn it into butter for other uses. Furthermore, I know that after you make butter, you have the leftover buttermilk. Unlike with buying butter at the store, I get to keep that resource and, even better, I get to find out what happens with it. For me, what’s been happening with it is I’ve been using it in the baking of cornbread or the making of pancakes, and soon I’ll try baking some bread from it. The ripples from my butter continue to spread, informing my life and playing out in the days to come. The buttermilk goes into the cornbread, then the butter goes on the cornbread. These small patterns and systems emerge. One action leads to another, and before you know it you’re filling your life with good work and good food. Suddenly, in this small ramekin of butter, I begin to find some semblance of being human. It sounds melodramatic, I know, and . . . well, it is. Yet, it also feels very true. Maybe I have too much of a sense of romanticism about the past, but the idea of having a small homestead and raising a cow, milking that cow, drinking that milk and turning it into other food such as cheese and yogurt and butter; using the byproducts of those activities to make still other kinds of food, some of which then recombine with the previous food; even taking the leftover milk from the cow and feeding it to other animals such as hogs or chickens, which then you eventually eat as well and turn into various other forms of food within the household; and all this providing you work that makes your living and provides your life meaning and satisfaction; that seems like a coherent human existence to me and one that provides ample opportunities to build and reinforce community, to live and work well, to understand and worship this world a bit more each day. The alternative industrial system that we’ve built and allowed to devour this older way of life doesn’t feel coherent to me at all. It feels empty and destructive, for the most part, and the pattern I most often see in it is degradation and alienation. Maybe asking butter to build a community is asking a bit much. But the amazing thing is that it actually can help do that, even though it’s so small, this one dish of butter. One more reason I love it. So let’s make some. Here are the steps. A few months back, I read a Sharon Astyk post in which she wrote about a new cookbook of sorts, Make the Bread, Buy the Butter by Jennifer Reese. In the book, Reese engages in a wide variety of food-centered homesteading activities, like making butter and baking bread, making her own prosciutto and camembert. As she tries these different tasks, she documents the process and makes recommendations for which to take the time to do yourself and which to go on purchasing from others, trying to figure out where one’s limited time is best invested. I haven’t read the book but found the concept fascinating. About the same time I read about the book, I found myself thinking about this series of posts on homesteading, The Household Economy, and how exactly I wanted to approach the writing of it. While I’ve made clear that the intent of the series is to focus on the various ways in which I engage my own household economy in pursuit of my broader goals of voluntary poverty, self-reliance and a modest life built on minimal money and energy, I wondered in what exact way it made sense for me to write about these activities. A series of posts as little more than step-by-step guides didn’t seem logical to me, mainly for the reason that such guides already are abundant on the internet for most of the activities I’ll be engaging in. Indeed, many of my activities will be carried out with the help of online guides, as well as with certain books I own. Simply duplicating that information makes little sense. These considerations at some point dovetailed with thoughts about Reese’s book and the idea of making the bread but simply buying the butter, assuming you didn’t have time to do both. Since I had surmised butter-making would be one of my regular homesteading activities this year, I wondered if the effort really made sense. The difference in taste between store bought butter and homemade butter did seem somewhat negligible and making butter—while not particularly hard—was a bit of a messy affair, and did require quite a bit of cream (at least to create the supply of butter I tend to use, with it standing in as my cooking fat most of the time.) Perhaps making my own butter didn’t make sense, after all. Despite these uncertainties, I made my own butter anyway. I wanted to at least try it, if nothing else. The first time I made it was with cream bought at a co-op in Portland, from a small scale Oregon dairy. The process proved extremely simple, though I did make a mess of a number of dishes and it did require a bit more time than I expected. But despite the clean up, I wanted to make butter again. Time passed before that happened, but I finally made a new batch of butter a few weeks ago. The cream for this butter came from my weekly supply of raw milk, skimmed off the top after sitting in the fridge for a few days. For some reason—perhaps due to some difference created during the pasteurization or perhaps because the skimmed cream was a lower fat content than the store bought cream—the process of making the butter took longer. However, since the agitation was done in a food processor, that proved to be the most minimal of inconveniences. It was more a curious occurrence than a problem. The final product was quite tasty and I enjoyed eating the butter smeared on bread. I couldn’t say it was an order of magnitude better than store bought butter, though. Better, yes, but not to the same degree as, say, eating fresh baked bread right from the oven in comparison to bread from the store. Furthermore, for my gallon or so of raw milk, I skimmed off a little over a pint of cream and ended up with around a quarter pound of butter. The next week’s process proved more successful, with a better skimming of about a pint and a half and around six ounces of butter, but I still realized that it takes a lot of milk to produce a modest amount of butter. I considered all these factors as I debated with myself as to whether or not to make butter regularly. The more I thought about it, the more variables I considered, until I finally managed to turn my consideration of butter into something of a philosophy of homesteading to be used for this series of posts. The philosophy is rooted in many of the same themes and considerations that have been and will continue permeating my How To Be Poor series on voluntary poverty, as well as the thoughts and ideas behind this blog in general. As such, the major underlying tenets that I’ll be using for this series are that I’ll be taking into account my own personal context, I’ll be looking to educate and demystify with these posts, and I’ll be focusing on patterns and systems. All of those tenets need further explanation, so if you don’t mind, I’ll now break out the bold. The matter of butter illuminates this tenet well. I’m already receiving a gallon of raw milk each week. 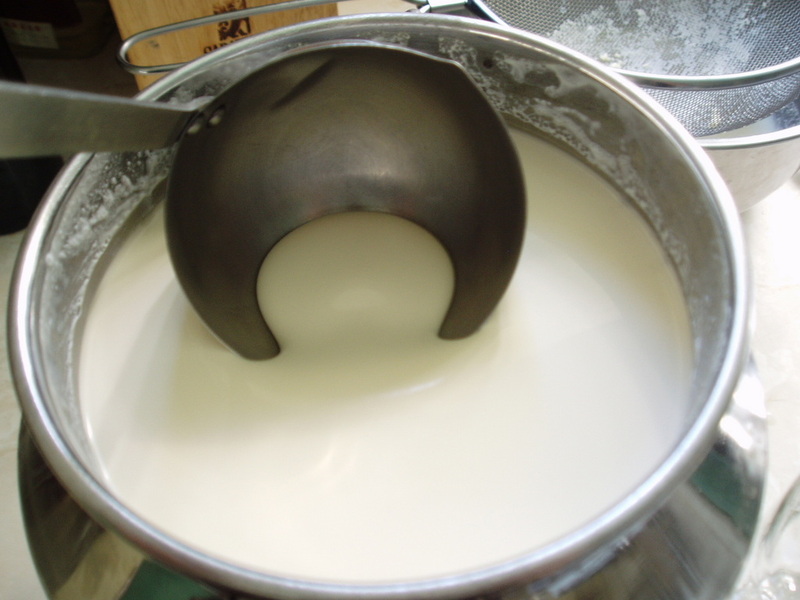 Raw milk, for those who may not be familiar with it, is simply milk that has not been pasteurized or homogenized. My milk comes from a local farm, it has a fat content higher than whole milk in the store, and it’s delicious. It comes in a steel milk pail that I return each week and which has a wide mouth lid on it. That means that each week, I can bring home my milk and leave it alone for a few days in the fridge until a good amount of the cream rises to the top, then I can skim off that cream and use it to make butter. Already receiving that milk is my context—with that context being that I already have available to me a weekly source of high quality, locally-produced cream and it even comes in a container that makes it easy for me to skim off and separate that cream. Since I have that source available to me, it makes sense that I make use of it to provide myself with butter. If I didn’t have this available to me, then making my own butter at home might involve simply going to the store and buying cream, bringing it home and then using that to make my own butter. While there’s nothing wrong with that, I’m not really creating the benefit of cutting out the middle man since I’m still buying the cream from the store, I’m probably not creating butter much different than what I could buy at the store, and I’m probably spending more money on it. What I’m doing instead, to a large degree, is simply introducing an extra step into my life for minimal benefit. Now, that doesn’t mean it might not be a great step to introduce. If I simply really enjoy the process of making the butter, than that’s great. Homesteading is fun outside of moral, ethical or financial concerns, without question. But while that fun is going to be present in this series, I also am intent on rooting it in context, in what makes sense, in the sort of activities that my life already is arranged for. I want to take into account my context and work within that context, rather than creating habits without concern for the rest of my life. In fact, this strikes me as the root of many of our problems in our society, and it contributes greatly to the unsustainability of our lives. I’ve written about this before and will write about it again, but it’s the fact that we don’t take into account our context and our personal situation when making so many of our decisions that brings us trouble. While personal debt, for instance, can arise out of situations out of our control, a good portion of it arises out of decisions made while ignoring our context, our personal reality. I know that has been the case for me before and there’s no question that our society and economy encourages this type of behavior. Our economy, in fact, is based on debt and expansion, regardless of the availability of resources for that expansion. If we find ourselves with so much stuff that our living space is overflowing, we too often look for a bigger living space rather than getting rid of some of our stuff. We consistently, in this society and economy, default to bigger and more expensive, to growth and physical abundance, when we could just as easily default to smaller, more limited, constrained, and cheap (in the monetary sense, not the quality sense.) We’ve lost touch with thrift and have dismissed the idea of limits. When we have a problem, we as often as not look for solutions rooted in technology, energy and money rather than in solutions rooted in limitation and behavioral change. We look at the life we want and then do whatever we can to try to gain it, often to our detriment. We rarely look for the best life we are capable of having and then achieve it within the limits of our reality. I don’t want to engage in every cool sounding homesteading activity just for the sake of doing it. I want it to arise naturally out of basic needs and my life’s circumstances. I want to make my butter not just because it’s fun—which, again, is a legitimate piece of this—but more importantly because it makes sense within the realities of my life. It flows from my circumstance and maximizes my resources. As such, it feeds my current goals rather than working against them. That’s important. One of the critical goals that I think can be achieved through homesteading is the slow build of skills and knowledge used to make one’s own living. Every time we find ourselves purchasing something we need at the store, provided by someone whom we likely don’t know or care about and who doesn’t know or care about us, we make ourselves vulnerable. We reduce the sovereignty we have over ourselves and our livelihood, and we endanger our family and community. We put ourselves at the mercy of others—most often, at the mercy of massive and amoral corporations and too-often-corrupt bureaucracies. Meanwhile, these same corporations and bureaucracies are finding their supporting infrastructure weakened and at risk of collapse. The necessary resources for these massive entities are becoming more limited, more scarce, and in many cases are nearing full scale disappearance. Our state of dependence is an incredible danger, a huge vulnerability for most of us. I’ve written plenty of times here on this blog about our need to reduce that state of dependence. Dramatically reducing the money, energy and resources we need is a big piece of limiting that dependence. Learning how to make, produce, or trade for many of our necessities is another huge piece and that’s the piece that I’ll be most focused on with this series. To successfully provide ourselves many of our own needs, though, we need a range of skills and education that many of us simply don’t have anymore. In just a few generations, we’ve lost a massive amount of knowledge and ability and now we need to relearn it as a culture as quickly as possible. Assisting that need will be another tenet of this series. I want my posts not just to be how-to guides, but to attempt to break down the underlying ideas and theories that make these homesteading activities beneficial and even revolutionary. For instance, to understand why making butter makes sense for me, I need to know what butter is and where it comes from. Sure, I can decide that I want to make butter, look up a how-to guide on the internet, then go buy some cream and do the deed. But there’s still a dependency in that. If I instead have a more complete knowledge that tells me that butter is a mix of butterfat, milk proteins and water; that it’s created by agitating cream so as to join together the molecules of butterfat by breaking down their surrounding membranes; that the cream comes from milk; that cream will rise to the top of non-homogenized milk if left alone for a certain length of time; and that the cream can then be skimmed off the top of the milk with a ladle; well, if I know all these things and others, then I have the sort of knowledge that allows me to parse my own context and recognize that with my weekly supply of raw and non-homogenized milk, I also potentially have a weekly supply of cream, which I can then use to make butter. Now, this may be known knowledge for a good number of people, but some out there don’t know it. But even if someone knows about butter, perhaps they don’t know anything about an enzyme cleaner, or why it is very effective at getting rid of certain stains and smells, or why it has many benefits over chemical cleaners, or how you make it at home, or the connection between why it gets rid of, say, the lingering smell of cat urine and why you can make it at home with some brown sugar and fruit trimmings. (Yes, I’ll be writing about this in a future post.) If you have all that knowledge, though, then you can begin to see and derive the sorts of patterns that effective homesteading make use of. Which brings me to the third tenet of these posts, which will be the exploration of patterns and systems. Let’s engage in one final consideration of my butter-making to better understand this. If I want to reduce my energy consumption, save money, maximize my resources and better build my own self-sufficiency, I should absolutely make butter utilizing the gallon of milk I already get every week. The milk already exists. A good amount of cream already exists in that milk. I can bring the milk home, wait a couple days, skim the cream, and then make butter. In doing so, I’ve eliminated the need to buy at least some of my butter, if perhaps not all. That’s less butter that needs to be made by machines, brought to me by way of industrial farming. I’m eliminating one of my life’s inputs and I’m not creating a new one at all—I’m actually just more effectively utilizing another one. I’m reducing the fat content of my milk, granted, but I’m already operating at a calorie surplus. I can transfer that fat to the form of butter, cut out the imported butter, and not need extra calories to make that up. I’ve just saved money and energy by making my own butter from an already existing resource and reduced my consumption. In so doing, I’ve taken another step toward my goals of voluntary poverty, have created greater self-reliance, and am helping build a stronger community and local economy. That right there is the pattern of my behavior. But there’s a systemic piece to this, too, that I want to elaborate on. If I’m anticipating a future in which large corporations and industrialism become less tenable and more expensive, and if I’m therefore looking to adjust my life so that it better fits into a local way of living—rooted in trade and barter, covenantal relationships and the sort of products and tools that can be made on a small scale, in a world of constrained energy and resources—well, then, my making butter fits that far better than my buying it. In such a world, there will almost certainly be a local dairy able to provide me a pail of raw milk each week. In such a world, there’s an excellent chance I could even barter or trade for that milk if I should need to, especially with the farming and ranching skills I’ve been developing. In such a world, I can just as easily skim the cream from my milk and I can even agitate it to make the butter without electricity if I should need to, transitioning from my food processor to a hand cranked mixer or just shaking the cream in a jar. Making butter at home currently uses some electricity, just by way of how I make it. But it doesn’t have to. There’s flexibility there and the adjustment could be made relatively easy if it needed to. That sort of flexibility and resiliency doesn’t exist for the store bought butter. The butter in the store comes out of industrial systems, dependent on industrial-grade energy and resource feeds. They’re dependent on all the supporting infrastructure that comes with our industrial economy—all the infrastructure that would be very vulnerable in an energy- and resource-constrained world. That butter at the store is going to be much harder to barter or trade for, as well, if I should find myself short on money at some point. Nothing about that shelf of butter in the store makes much sense in a future beset by constraints on industrialism and it would be much harder to convert said shelf of butter to a low-energy way of life than it would be for me to switch from an electric food processor to a hand mixer or jar while making my butter. The systems I see us having to deal with in the future are going to be much different than the ones we deal with today. Making my butter at home fits that future system far, far better than buying my butter at the store. Wendell Berry wrote an excellent essay some decades ago titled “Solving For Pattern” (PDF). In it, Berry writes, “A good solution acts within the larger pattern the way a healthy organ acts within the body.” Making my own butter seems like just such a good solution. It acts within the larger pattern, reducing my energy and resource usage while making use of already-existing resources and behavior, and further enhancing my life’s resiliency by increasing the flexibility with which I may react to the future. This small homesteading activity fits within the broader patterns—both existing and desired—of my life. It’s the exact sort of homesteading activity that I’ll be writing about in this series. My hope is that by following the above principles, I’ll create a series that will prove a bit more holistic and informative than simply producing a number of how-to guides. While I still intend to include step-by-step instructions for these various homesteading activities, they’ll come after I provide the context of what I’m doing and how it fits into my goals. In this way, I hope this series will, more than anything, reinforce the idea of homesteading and a patterned approach to it that will prove beneficial in the sort of constrained future I think we face—or at least will prove beneficial for those looking to live their lives a bit more modestly, whether or not they think such modesty will turn into a necessity. As should by now seem befitting, the first project I’ll be writing about is homemade raw butter. That will be the next post, arriving soon.